Yew Ching Wong is one of the most highly respected and experienced kungfu practitioners in the United States today. Wong began his life-long study of kungfu in the Hung Chia (Hung Gar) style under Lin Tsu (Lum Jo) in Hong Kong. Wong is known best for his Hung Gar. however, he is also proficient in the Northern Pi Kua system, which he learned from Keng Te-Hai (Kun Duk Hoi). In addition, Wong is highly skilled in Tai Chi Ch'uan, Pa Kua Chang, and Hsin-I (Sum Yi - a style emphasizing standing meditation). Wong has been teaching in San Francisco since 1966. In the March/April 1992 issue of the Pa Kua Chang Newsletter (Vol 2. No. 3) Y.C. Wong's Pa Kua Chang experience was detailed in an article by Ken Fish. Here Ken Fish describes the Eight Mother Palms (Pa Mu Chang) of Pa Kua Chang as taught by Y. C. Wong. 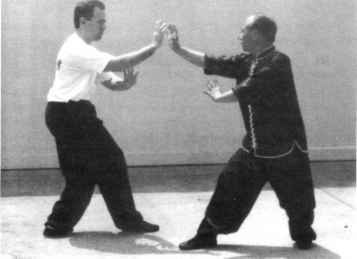 Pa Kua Chang, practiced as a system, is no different from any other Chinese martial art whether so called internal or external. The student must train himself to acquire certain habits of motion and make himself physically strong. 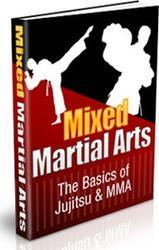 In Pa Kua Chang, as in most Chinese martial arts, this training is ancillary to the well known form sequences. I have heard some Pa Kua practitioners argue that Pa Kua training begins and ends with the 64 palm set. It has been my experience that most teachers in China who practice Pa Kua as anything other than a performance art teach a broad syllabus of additional material, much of which is prerequisite to the proper performance of the Pa Kua 64 palm set. Some teachers in America believe that static posture training is not a part of pure Pa Kua and believe that it is an adulteration from other systems. Whether or not such training originates elsewhere, the need for such training, regardless of the level of the student, seems obvious. they all make reference to some form of basic stance training and basic moving posture training. By moving posture training I am referring to execution of stepping techniques or walking the circle practice while holding a static upper body posture. The goal of this training includes proper alignment, power development, stepping, and other components of Pa Kua mechanics, and also includes ch'i kung and nei kung training. For example, Sun Hsi-Kun, in his book The Real Pa Kua Chang, has a section which includes static horse stance posture training and five walking stance training exercises. Ni Ching-He, in his book Internal Pa Kua Chang, lists eight fundamental moving postures and also includes a section on static work. Hao Hsin-Lien, currently one of the better known writers on internal martial arts in Northern China, similarly includes a section on basic stances and training in his book The Essence of Pa Kua Chang. He too lists four moving stance exercises in addition to the walking the circle exercise, which each of these authors place emphasis on, as a prerequisite for practice. The goal here Is to develop springy, supple, trained strength and to develop a feeling for ch'i in each movement. Huang Po-Nien, a well known student of Li Tsun-I, in his "Dragon Shaped Pa Kua Chang" published in the 1930's, also includes a section on posture work. He states that standing postures and walking the circle in simple postures are crucial training methods. Several of the postures shown in his book resemble Hsing-I postures. 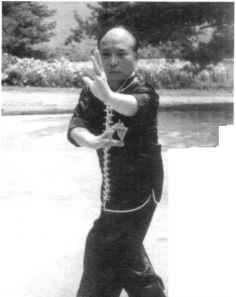 Liu Feng-Ts'ai, one of the standard bearers of Kao I-Sheng style Pa Kua Chang says that, "Pa Kua basic practice is divided into static and moving postures, that is, standing post training' and walking 'post training.'" He states that the nine palace exercise, which many consider one of the most advanced Pa Kua training methods, is really only a somewhat complicated moving form of stance training. He continues by saying that, "In stance training one trains the same way as the Pa Kua set. The height is adjusted according to the abilities of the trainee, as is the speed. Breathing should be deep and even, and one's attitude and appearance should be relaxed and natural. Postures should seem rounded and full with a balance of firm and supple qualities to the movement. In walking it is considered a crucial fault to bob up and down and to breath unevenly, to use brute force, and to thrust out one's chest." In Kao style Pa Kua there are two main static postures, one is the "preheaven" posture, or Hsien T'ien Chuang. The second posture is the Hou T'ien Chuang which is the same as the starting posture for the "later-heaven" 64 straight line movements. 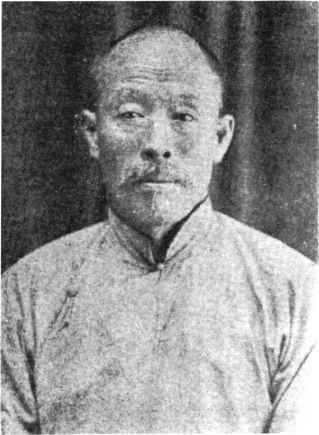 Tien Chuang. The weight distribution in this posture is 30% on the front leg and 70% on the rear leg. The second posture is the Hou Tien Chuang which is the same as the starting posture for the "later-heaven'' 64 straight line movements and resembles Hsing-I Ch'uan's San Ts'ai posture. The moving postures, which are sometimes called the "mother palms," or "basic palms," seem to differ from teacher to teacher even among Kao's students. Y. C. Wong, who teaches the Kao I-Sheng style Pa Kua Chang in San Francisco, begins all of his students with static postures from Pa Kua Chang and I-Ch'uan. Wong believes, as do most teachers, that it is only through this kind of practice that one can develop supple, springy power, a stable stance in motion, and proper alignment. 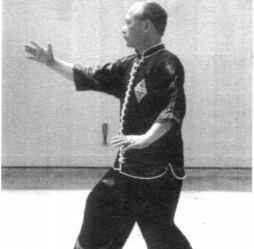 Once a student has shown some progress in static postures, Wong begins training them in the circle walking stepping and the eight mother palms. The eight palms are shown in the photographs accompanying this article (pages 28-29). In executing the eight mother palm circle walking exericse, the practitioner will simply hold each of the eight upper body postures while walking around the Pa Kua circle. The posture is held while walking in one direction for as long as desired and then a simple k'ou pu pai pu stepping manuever initiates a change of direction. The practitioner walks the circle in the other direction holding the same posture. The arm movement performed with the kou pu pai pu steps is simply a crossing of the arms in most changes. The Tan Huan Chang change is a bit more complex and thus is described in more detail later in the article. Once the practitioner has walked the desired number of times around the circle in both directions holding one palm, then the next palm is executed in the same manner. Hou T'ien Chuang heel never raises higher than the toes. Each foot raises and falls as if skimming over the surface of the ground, without rolling from heel to toe. With each step the feet should seem to brush against each other. The spine should be vertical and one should feel as if the base of one's spine is pulling towards the ground. The crown of one's head should push up. stretching the neck. The shoulders should extend away from the center of the body and should be relaxed. It is important that the student not use force, but instead use only enough strength as necessary to maintain the posture. The goal here is to develop springy, supple, trained strength and to develop a feeling for ch'i in each movement. One's eyes should always look towards the center of the circle, although not necessarily at one's hands. There should be strength in each step issuing from the heel of the rear foot. The toes of the forward foot should be as if pushing an object ahead. How do you walk a straight line in Pa Kua Chang?